When the state supreme court affirmed the rights of private property owners at a Kennebunkport beach, advocates for public use all over Maine found reasons to cheer and to worry. WASHINGTON — The sandy beaches that stretch in front of expensive homes in the Goose Rocks section of Kennebunkport are leagues away – literally and figuratively – from the 14,500 miles of snowmobile trails that crisscross Maine’s wooded interior. Yet when 29 Goose Rocks property owners lawyered up to fight Kennebunkport’s attempt to guarantee public access to the beaches fronting their homes, they found eager allies in the influential organizations that represent snowmobilers and the owners of Maine’s vast commercial forestlands. The Goose Rocks Beach case decided last week by Maine’s top court was, on the surface, the latest precedent-setting ruling over who should control access to most of Maine’s 3,500 miles of coastline: the property owners or the public. However, the implications of the Goose Rocks case will likely extend far beyond Kennebunkport to other beach disputes – and potentially inland as well. The case could make it harder for municipalities or interest groups to claim that the public’s longstanding recreational use of private land – whether a beach or a wooded trail – outweighs the owner’s objections to those activities on the property. In the Goose Rocks case, the property owners clearly won when the court ruled that beachfront homeowners – not the town – have the right to say whether the public can stroll, sunbathe or play Frisbee on their sandy strip. To supporters, the decision reaffirmed the rights of private property owners from Kittery to Madawaska and, in the process, helped protect Mainers’ access to private land. That’s because removing the threat of guaranteed access by “prescriptive easement” will encourage landowners to keep their property open to the public. Critics predict the opposite, saying the ruling could threaten the public’s access to places beloved by generations of visitors. “This was a disappointing case for the town, but in some ways I would say it is worse for the state of Maine and for anybody in the state who has used a private beach as a member of the public,” said Amy Tchao, the attorney who represented the town of Kennebunkport and other town property owners fighting for legal access to Goose Rocks Beach. It’s a dispute rooted in differing interpretations of a 370-year-old ordinance – penned by people who lived three or four generations before the Founding Fathers – that still dictates who can do what along the coast of Maine and Massachusetts. Maine courts have interpreted the “fishing, fowling and navigation” language quite literally, meaning today’s beach-goers have no right to use the intertidal area for other pursuits without the landowner’s permission. This Colonial-era interpretation granting private individuals ownership of the wet sands of the coastline applies in only six states: Maine, Massachusetts, New Hampshire, New Jersey, Pennsylvania and Virginia. Everywhere else, the intertidal area is state-owned land to be held in the “public trust” for the people’s use, another concept that dates back to Roman times. Nearly four centuries later after the Colonial Ordinance was written down, the language still inspires legal challenges in Maine and elsewhere. Unlike many beach access cases, the fight over Goose Rocks didn’t start with a “No Trespassing” sign suddenly warning away would-be beach-goers. Kennebunkport residents and visitors to the town have freely used the three-mile stretch of beach for well over a century and continue to use it today. In a pre-emptive move to protect that access into the future, town leaders and non-beachfront property owners asserted that historical usage essentially gave the public a legal right – known as a “prescriptive easement” – to continue doing so. “The public’s roots in a beach can run so deep and for so long … that our law has said for years that, at some point, those rights cannot be taken away,” said Tchao, Kennebunkport’s attorney who works at the Portland law firm of Drummond Woodsum. 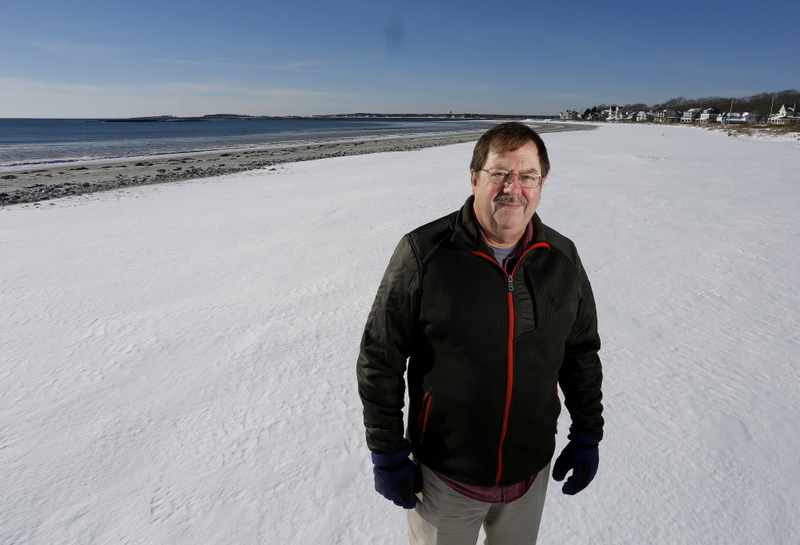 In 2012, Kennebunkport officials also negotiated access agreements with 63 other landowners along Goose Rocks Beach to ensure that the public can use the beach in front of their properties. To qualify for a prescriptive easement under Maine law, a property must have been continually used by the public – without a landowner’s permission – for at least 20 years. Bob Scribner’s family has allowed the public to use the beach in front of their Goose Rocks home for more than a century. To Scribner and more than two dozen of his neighbors, however, the town’s actions went too far. “It was an attempt by the town to exert control over our property rights,” Scribner said. Scribner said he and the other 28 plaintiffs challenging Kennebunkport’s easement claim have no intention of “privatizing” their stretch of Goose Rocks. Instead, the lawsuit was intended “to clear the title” and protect their property rights. Kennebunkport resident Nancy Viehmann has a different perspective. Viehmann and her husband, Tony, also own waterfront property that is open to the public. Unlike the oceanfront at Goose Rocks, however, the Viehmanns’ shoreline is not sandy beach. This particular segment of Maine’s lengthy coastline has been a hotbed for legal action over beach access. Over the past 25 years, Maine’s top court has handed down three major cases centered on a 12-mile stretch of seashore from Moody and Wells beaches in Wells and to Goose Rocks in Kennebunkport. As in the two Wells cases, the Kennebunkport case appears likely to set legal precedent for beach battles elsewhere. Groups are currently fighting with property owners for access along Cliff Walk in York and to Cedar Beach in Harpswell. Steinman, like many of those interested in public access cases, was still dissecting the Maine Supreme Judicial Court’s ruling late last week. While the Law Court made a clear ruling on the “prescriptive easement” question, it did not address a host of other issues – most notably whether the “fishing, fowling and navigation” exemptions should be expanded to reflect the way most Americans use beaches today. The Law Court left that issue up to York County Superior Court, much to the dismay of the Maine Attorney General’s Office, the Surfrider Foundation and other groups pushing to expand upon Colonial Ordinance language they view as antiquated. “I believe this could have, should have and still will be the case to expand those uses, but the court has said it is not time yet,” said Steinman, whose group fought successfully in 2011 to include scuba diving among the activities allowed in Maine under the “navigation” category. Just south of Kennebunkport along Route 9, the town of Wells relies on a prescriptive easement to guarantee public access to the large stretch of Wells Beach not owned by the town. With more hotel rooms and campsites than residential homes, Wells is entirely dependent on beach access for its economic livelihood. Wells Beach is so important to the town’s tourism that the town has maintained the beach and access to it for decades. And that history justified the prescriptive easement. Wells Town Manager Jonathan Carter, whose tenure dates back to that first Moody Beach case in 1989, said he was surprised by the ruling because he and others saw the court as “loosening up a little bit” on public beach access issues. Carter is hopeful that the Goose Rocks ruling will not affect Wells Beach. John Duff, an associate professor of environmental law and policy at the University of Massachusetts Boston, said prescriptive easements remain viable options in Maine. But future applicants for prescriptive easements will have to meet a lengthier check-list, of sorts, to overcome Maine’s “presumptive permission” standards and will have to do it parcel by parcel, he said. “For a long time, ambiguities in the law were not problematic since the use or pressure on the coast was not particularly high,” said Duff, a former University of Maine School of Law professor who authored a guide on shoreline access laws in Maine. “As the pressure does increase, the ambiguities that existed lead to different beliefs by different user groups. But does the Goose Rocks case have implications for public access to private land beyond the intertidal zone? The Maine supreme court justices certainly put the case in that broader context as they drew a clear legal line between guaranteed public access obtained through a prescriptive easement versus the access granted passively (or “presumptively”) by property owners who don’t gate, fence or otherwise “post” their land. The Maine Snowmobile Association and the Maine Forest Products Council – the organization that represents commercial forestland owners who control most of Maine to the north, east and west of Bangor – saw relevance in the Kennebunkport beach case. Both groups filed “friends of the court” briefs in support of the Goose Rocks Beach property owners. Meyers, the snowmobile association’s executive director, estimated that 95 percent of the state’s 14,500 miles of official snowmobile trails are on private property. The entire snowmobiling industry – worth an estimated $350 million in 2010, with much of that flowing to rural Maine – depends on landowners giving riders permission to pass through their property, Meyers said. Many landowners regard prescriptive easements as a threat to their property rights. So the written permission forms that the Maine Snowmobile Association provides to local clubs seeking access to private property explicitly state that snowmobilers cannot use that access to justify a prescriptive easement years down the line. “Our trail system is predicated on permissive use of private land, and that’s what this case was all about,” Meyers said of the Kennebunkport beach battle. Benjamin Leoni, one of the attorneys representing Scribner and the other Goose Rocks homeowners, said the case “impacts far more than just beaches” and will benefit all of the nature-based tourism that depends on landowner permission. “This case states that a property owner can continue to allow recreational use as they have in the past without fear of losing an interest or a right in their property,” Leoni said. But Tchao, Kennebunkport’s attorney, suggested that the ruling could lead to barriers on property that has been used by generations of families. So while Goose Rocks homeowners currently allow the public to use their beaches, there are no guarantees into the future.